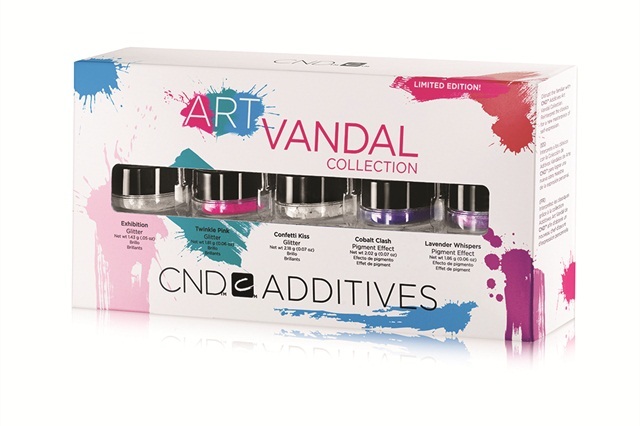 CND’s spring 2016 Art Vandal Additives Collection reinterprets the classics to allow you to create nails with bright strokes of color for a redesigned, repurposed interpretation of nail art. Follow these steps to learn how to make a watercolor effect with added texture and dimension. 1. Prep the natural nail and apply a CND tip. Apply a thin base layer of Retention+ Sculpting Powder Clear and finish with the 180-grit side of the Hot Shot File. Dip a clear bead of Retention Liquid and Powder into CND Additives Cerulean Blue and blend together on a piece of palette paper. Apply the bead diagonally across the top third of the nail, pressing toward the middle of the nail to feather out the color slightly. 2. Repeat with Additives Lavender Whispers across the center. 3. Repeat with Additives Haute Pink at the tip of the nail. Apply Perfect Color Powder Pure White to the sidewalls of the nail to encase the edges of the design. Refine with a file if needed. 4. Apply a thin layer of Brisa Gloss. Cure for one minute in the CND LED light. Wipe with 99% Isopropyl Alcohol to remove top film. For more information on CND,click here.